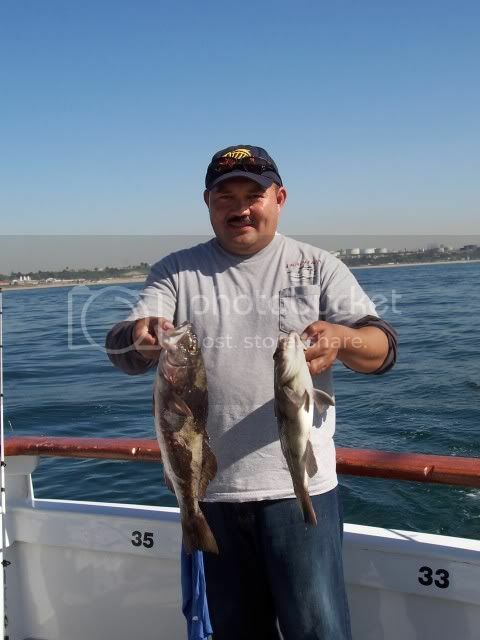 Okay FNN, here it is - my long awaited how-to article on structure sand bass fishing in the Santa Monica Bay. I hope you enjoy reading it as much as I enjoyed writing it. 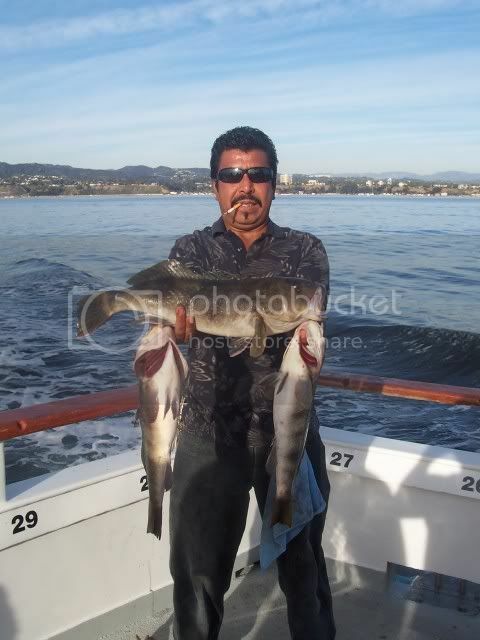 When I was younger, my dad and I fished out of Dana Point. That area is filled with natural reefs and artificial reefs, with plenty of hard bottom spots. We fished 10 and 12 pound test for the bass even while fishing the artificial reefs because the structure was not too rugged, and we landed plenty of big bass off of these spots. 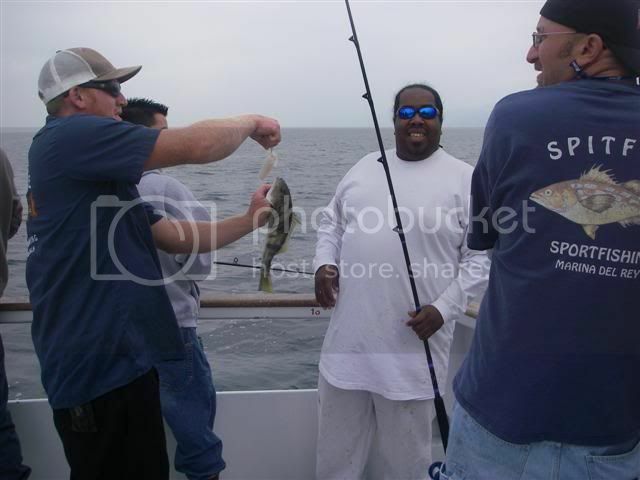 In 2009, I got to experience structure sand bass fishing in the Santa Monica Bay for the first time, and let me tell you, it’s hard! I lost plenty of leadheads and fish in my first time fishing these treacherous artificial reefs that most refer to as “stones”. After watching guys that were experienced at it, I grew to love it and caught more fish each time I went out. 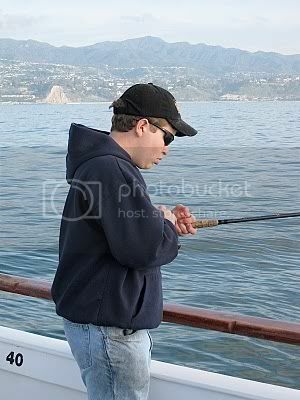 Don’t be discouraged if you don’t do too well your first couple times trying this fishing. It’s tricky, but once you get the hang of it, you’ll love it – trust me. The artificial reefs I’m referring to are scattered around the Santa Monica Bay, with the vast majority of them being off of Malibu and Santa Monica. 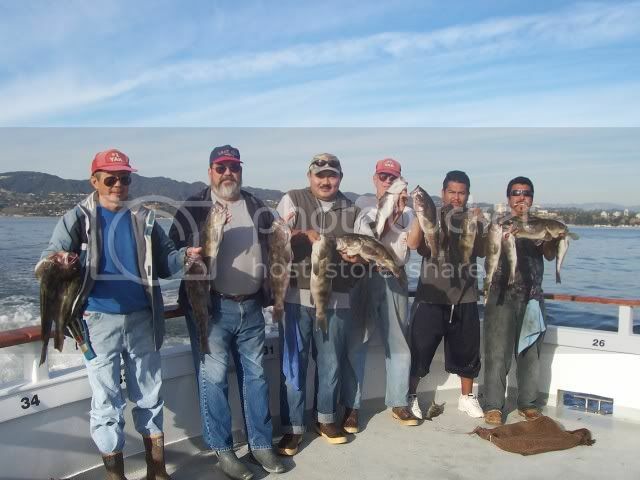 These reefs were planted in the 60s, 70s, and 80s, and ever since they have provided habitat for many species of fish such as sculpin, perch, sheephead, sculpin, cabazon, triggerfish, and of course, the popular sand bass. Most of the stones are in 40 to 60 feet, with a few other stones and wrecks out deeper to 90 feet. If you were to dive on some of these spots, I bet you would see plenty of old tackle and fishing line. These stones are very rugged with plenty of crevices for the fish to hide, so, you must come prepared! Begin by having a rod and reel that you feel comfortable with, something not too heavy, but not too light. My favorite set-up for this kind of fishing is a Trinidad 14 on an eight foot medium heavy Calcutta rod with 25 pound test. 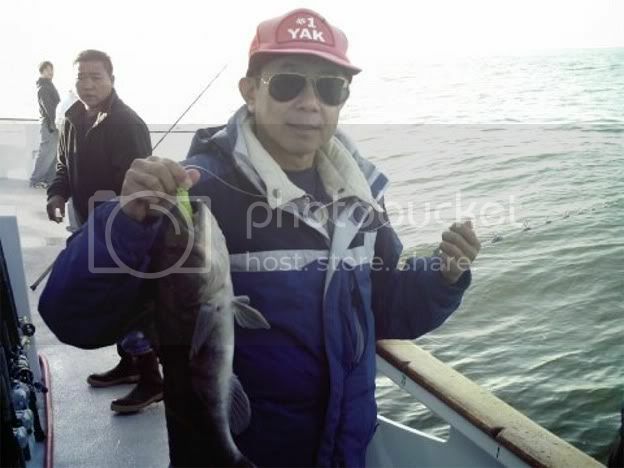 Others fish Avets, Saltigas, Sealines, Saltists, and Newells, but it is entirely up to you – just use a rig you feel comfortable using, because to be successful, you have to fish hard! The line is the most important thing. You need to use heavier line – it’s not the size of the fish, but the structure they live in! Most recommend starting with 25 pound test, and if the fish are getting you stuck in the rocks and breaking you off constantly, don’t be afraid to go up to 40 pound test. Sometimes, the fish will get a little twitchy and some anglers will go down to 20 pound test. While they may get more bites, the hook-to-land ratio goes down. You be the judge of what needs to be done. Next, don’t go light when it comes to leadheads. Bring plenty of one and a half to three ounce leadheads, because some days you will lose a ton of lead. Most of the time I use an ounce and a half, but sometimes current will get really bad and you will need the heavier head. Personally I would also pack some really light leadheads – it would probably come in handy on days where the current is slack and the fish are twitchy. Color of the leadhead doesn’t really matter, as plenty of fish have been caught on the plain leadhead. However, popular colors include chartreuse, glow-in-the-dark, and a brown-red mix. 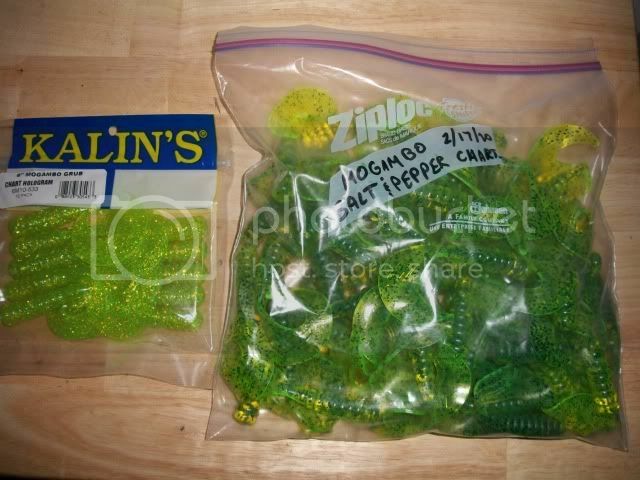 Lastly, I would highly recommend bringing six inch Kalin’s Mogambo Grubs in the chartreuse, chartreuse salt and pepper, and slime colors. These plastic grubs are very popular and provide a little extra enticement factor to the fish. Most of the time, the fish will be eager to bite your bait with the six inch plastic grub, but sometimes when the fish get really finicky, a smaller grub would be the way to go. Ocean Logic from Wal-Mart makes a really great chartreuse four inch grub that would be perfect in this situation. However, when the fish want to really chew, they will be always eager to engulf a leadhead with a whole squid threaded up the shank of the hook. By the way, you can get mogambos from Wal-Mart, any tackle store, or you can order them online in bulk – I think the latter is the way to go, because of the value and you will have them for a long time to come. Make sure you bring a lot of leadheads, as you may lose a lot! Shown below are chartreuse, chartreuse salt and pepper, and glow in the dark mogambo grubs slipped onto leadheads. On left is the common 10-pack of Kalin’s Mogambo Grubs, and on the right is from a bulk order of 100 chartreuse salt and pepper mogambos. As you can see, they will last you for a long time to come. Fresh dead squid is more often than not the bait of choice for fishing these stones. Most often the fish will be eager to eat a whole fresh dead squid even with a mogambo slipped on the leadhead, but again when the fish are finicky, using strips would be the best way to go. Sometimes you will be lucky and the sportboat will have live squid, and that is the best bait of all for fishing the artificial reefs. Fresh dead squid for the day’s fishing. You’ve got all the necessary gear…now you’re ready for the fishing! 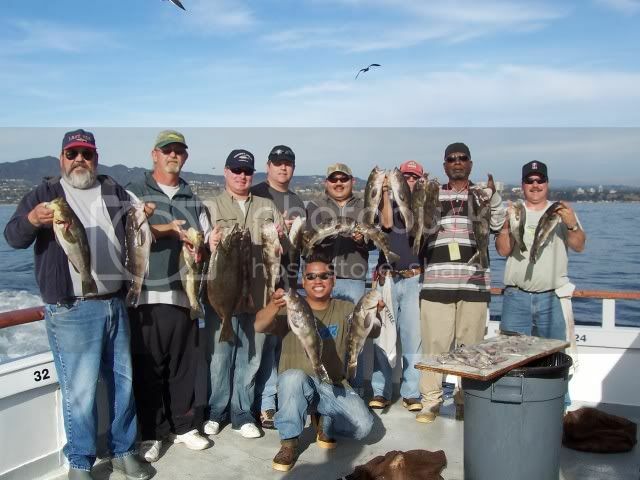 Your trip will begin with a stop at the bait receiver to pick up sardines or live squid. The sardines aren’t useless, as the captain may want to try a halibut drift and halibut do live in between these artificial reefs, so bring some torpedo sinkers and hooks just in case. 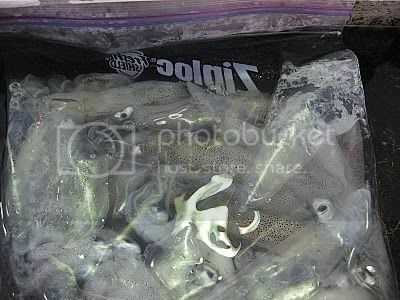 If the receiver does not have live squid, it is possible that you will get it off a boat, but most likely, the crew will already have a batch of squid from the freezer that will work very well for the bass. I would have a squid catcher in your box just in case for the off chance you will be snagging squid. Anyways with the bait all ready, time to fish! En route to your first location, it’s time to tie up your rigs! Any knot will work fine, but you may want to double up your line with a spider hitch or a uni-knot loop, but personally I would start with the regular knot, and switch over if you need to. The captain will meter around the reef he wants to fish. Sometimes, there will be two reefs very close together, and he might anchor between them. Wait until the boat settles back before you cast your line in. Now here’s where the tricky part comes into play. These stones are relatively small, so you need to see where people are “hanging the rock”, and fish as close to you can to them, without pushing anyone out of their spot. The idea is to move around and locate the rock, because if you’re not in the rock, you’re not fishing. You need to work together to catch fish. Even if you’re not on the main part of the reef, you could be dropping on an edge that will have plenty of grumpy sand bass. Wherever the reef may be relative to the boat, you may have to make a long cast, a lob cast, or drop straight down – look around you and see where people are feeling the rock. Next, let’s talk about the annoying perch. There are a ton of blacksmith perch on these reefs. They are actually great eating, so if you want to load up, drop a couple of small hooks with small squid strips, and have at it. However, if you want to catch a bass, ignore them. Let them peck away at your bait, because they will get the bass’ attention. This next step is the hardest thing about structure sand bass fishing – differentiating between a perch bite and a bass bite. The perch bite will be a continuous pecking action that will not put a load on the rod. A bass bite will have either a thumping or larger pecking action. Believe me, once you get the hang of it, you will know the difference between a perch bite and a bass bite. When your bait is in the structure, you will get hung up sometimes. Don’t drive your leadhead into the rock, just loosen the line a tad, and give the rod a couple of popping motions, and you should be okay. Don’t fret if you lose the leadhead, it’s all a part of the game – in other words, if you’re sending down a favorite lure, have more of that favorite lure on hand! Most of the time that popping motion will work – just remember not to drive the hook into the rock. Well, you were patient and you finally got a bass bite! Don’t think about it, you need to react fast to get that bass up many crucial feet out of the rocks. Sometimes, it takes falling into a crevice of the rock to get bit, so you absolutely need ninja-like reflexes. When you get that bite, swing and wind quickly at the same time. If you feel the fish but you also feel the rock, keep winding, because your line may be all frayed, but you can still get the fish up. Don’t delay, just keep winding until you get the fish out of the rocks, and you’re all clear, but it is still important to have a nice steady wind, because you don’t want a weak point in the line to fail on the way up. Once you get the fish up, you may notice that several feet of line are completely frayed. Even if you feel the smallest fray, don’t think you can get away with that – retie! It will be worth it in the long run and you will have a much better chance on the next fish. Sometimes, a small calico or even a big sand bass might come out of its hole and hit you right before you hit the bottom. Pay close attention and keep your line taut, and you will be richly rewarded! Good times will be had by all while fishing the stones. Everybody working together and fishing hard at the rail. These homeguard sand bass sure know every nook and cranny of their home, and they know where to go once they have their food. If you wait too long, the bass will wedge itself in the rock by flaring out its gills, much like you see them do when they lay on the deck. If you feel the rock rubbing against them as you pull them from the rocks, you will probably notice many scratch marks on them – well, you know why. Once you get them out of the rocks, just a slow, steady wind is sufficient. 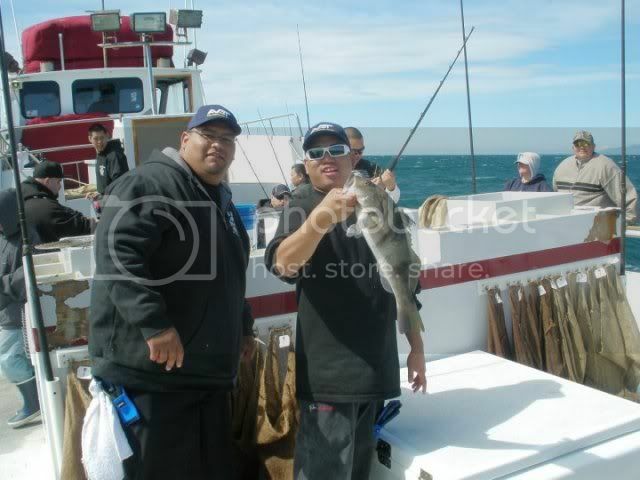 Mike with a big grumpy sand bass caught in March 2010. 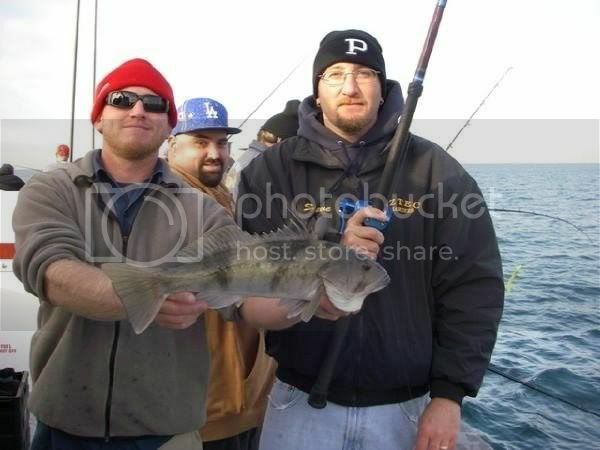 Author with two nice sand bass caught in December 2009. Carlos with a group of big sandies. 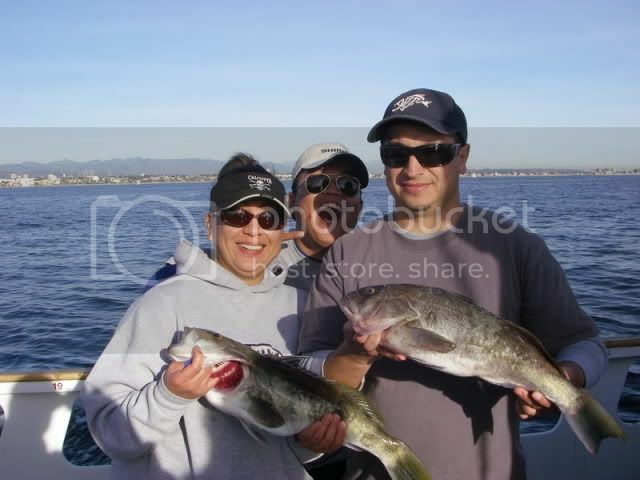 Juan and Larissa with some nice grumpy sand bass. Steve and Morgon with a nice big sand bass. Chak with a nice sand bass caught on a mogambo grub. 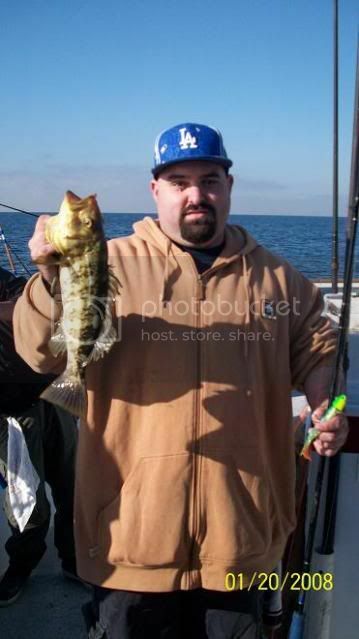 Terry with another nice sand bass. 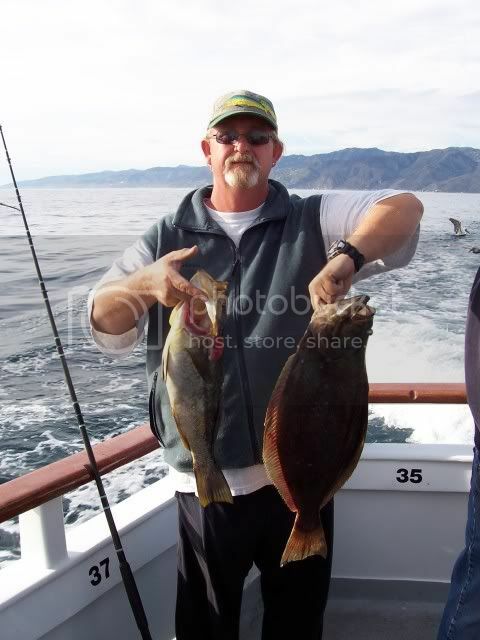 Ray with a couple sand bass caught in February 2010. 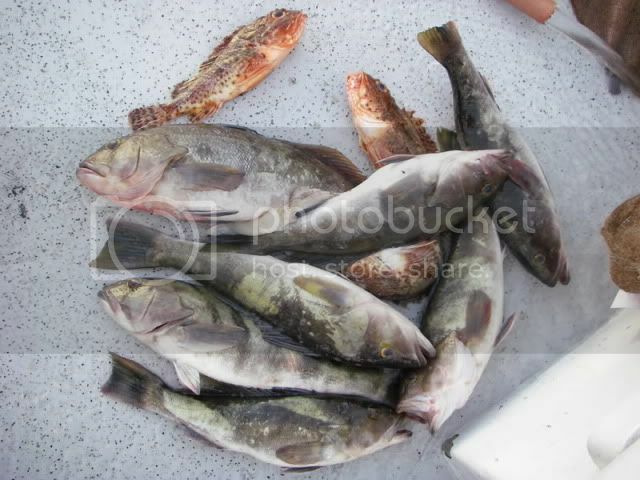 Bounty of sand bass for a day’s fishing. Morgon and Carlos with the jackpot weigh in. A big sand bass will more often than not take the jackpot for the day. Calico bass abound these reefs also. 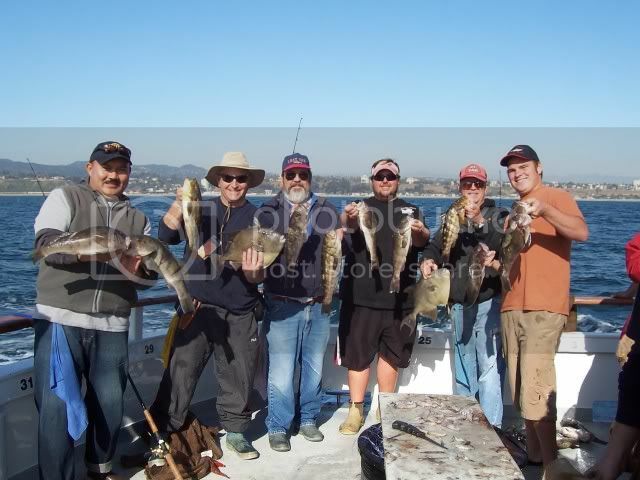 Most of them are shorts, but quite a few nice ones live mixed in with the plentiful sand bass. As previously stated, you will find that they will be willing to hit a bait on the way down. Not much to say about these guys, but any calico over three pounds is suggested to be released for the future of these fine game fish. Larissa with a nice calico bass caught in December 2007. 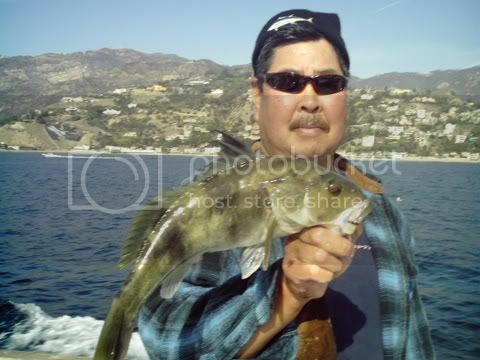 Oz with a nice calico bass caught in January 2008. 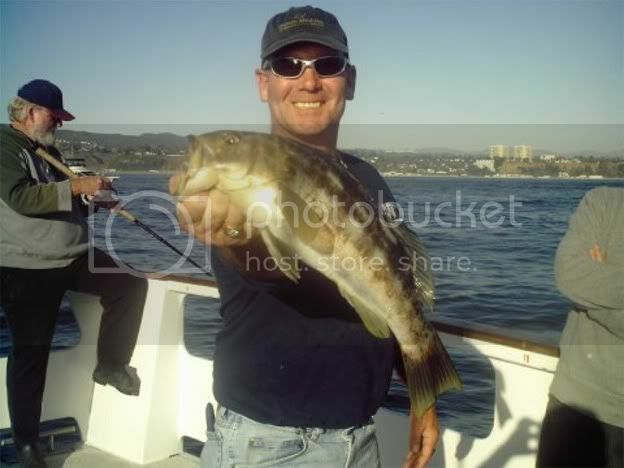 Kenny Mac with a nice calico bass caught in January 2006. While not as common as catching bass on these reefs, there are quite a few triggerfish in these reefs that put up a great fight and are great to eat. Triggerfish will bite your bait like a big perch. You will feel a series of big taps, and once your rod loads up, set the hook, and keep winding like normal. They come in with a pretty erratic pattern, but don’t worry and keep winding until they are to the boat. These triggers range from just bigger than your hand to trash can lid sized. If you miss a trigger, you will know it because your mogambo tail might be missing – that’s definitely a triggerfish bite. 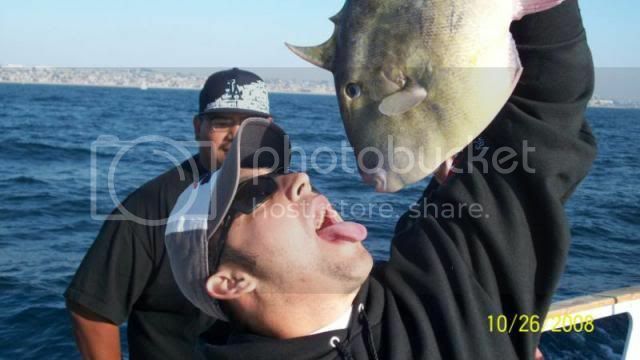 As previously said, triggerfish are great eating. If you pan fry them, cook them just like you would a pork chop, or if you like ceviche, they are great fare for that. 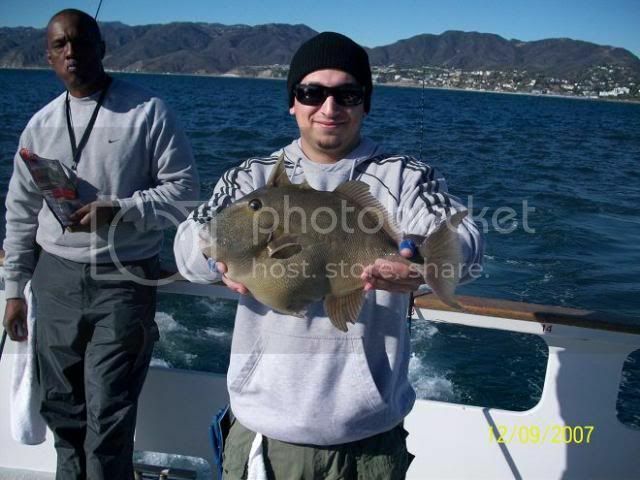 Jason with a nice triggerfish caught in October 2008. This fish won both the jackpot and the BBFC side bet. Watch out! These triggers have some serious teeth, so don’t get too close! 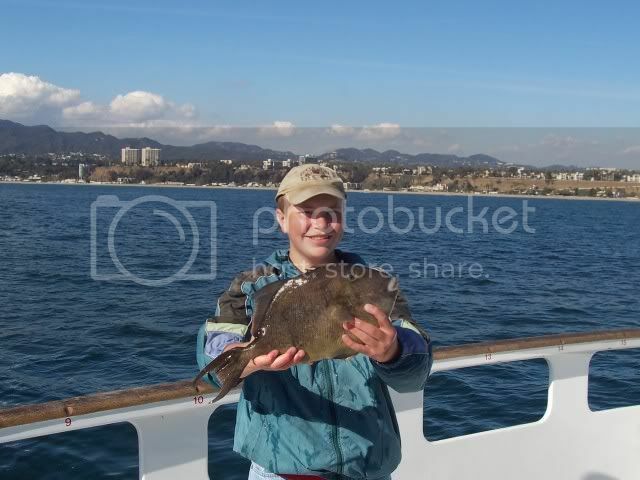 Author with a nice triggerfish caught in February 2009. About the smallest you will see a triggerfish caught. 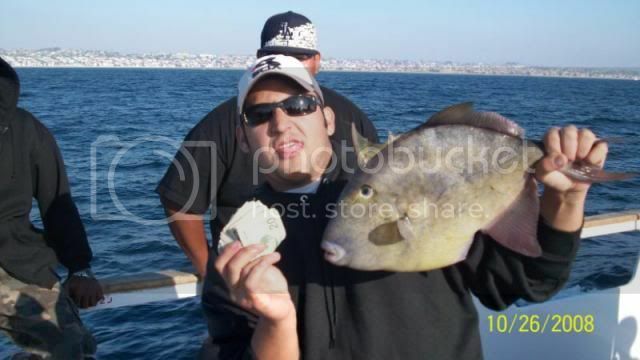 Juan with a nice triggerfish caught in December 2007. There are many other species that live in these reefs. There are quite a few sculpin that make the stones their home, and quite a few are economy sized. There are also cabazon, which are great eating and known for their flaky texture. 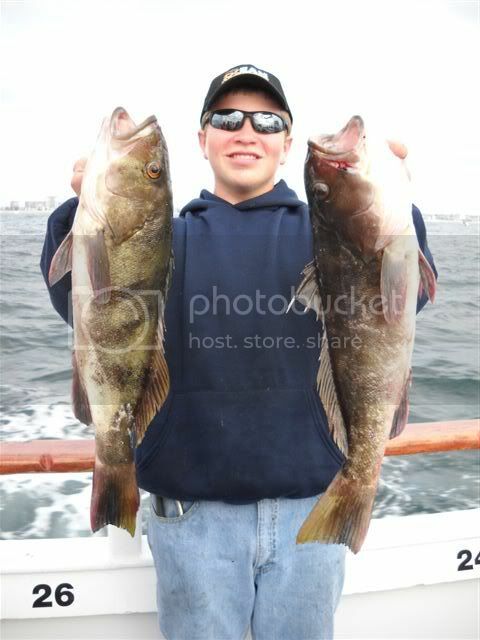 Sheephead also are residents, and if they are in season, bring some shrimp and try for some sheephead. 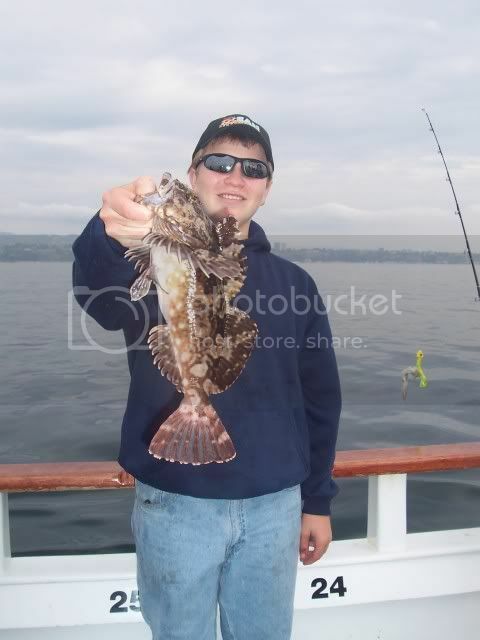 You might even catch a halibut in between the reefs – you never know! When you drop your bait down, you won’t necessarily catch a bass, and that’s the best thing about saltwater fishing. 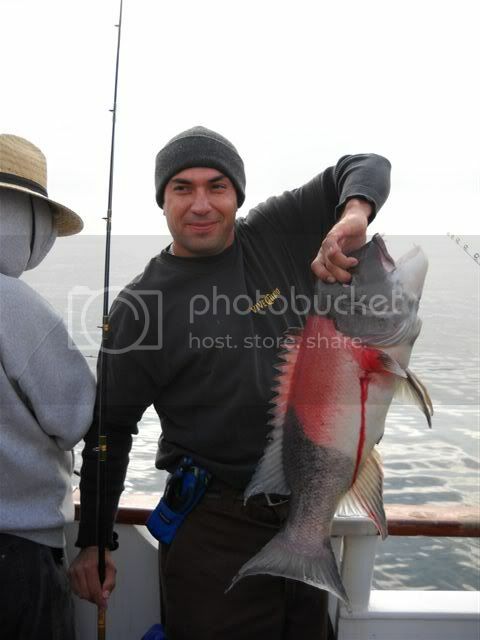 Nice sheephead caught in December 2009. This big goat weighed in at 13 pounds. 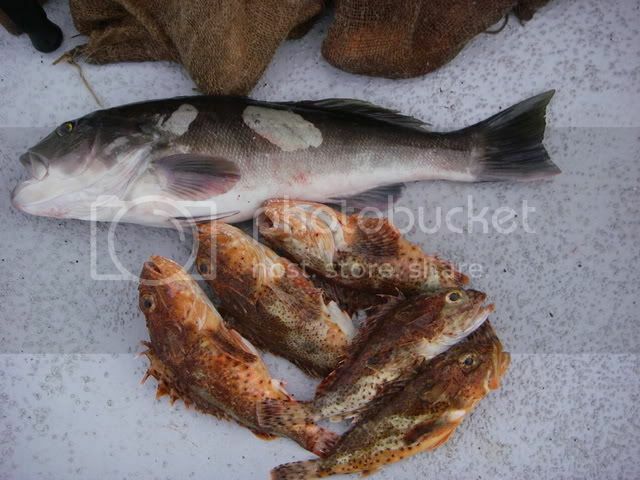 Another nice sheephead caught in December 2009. 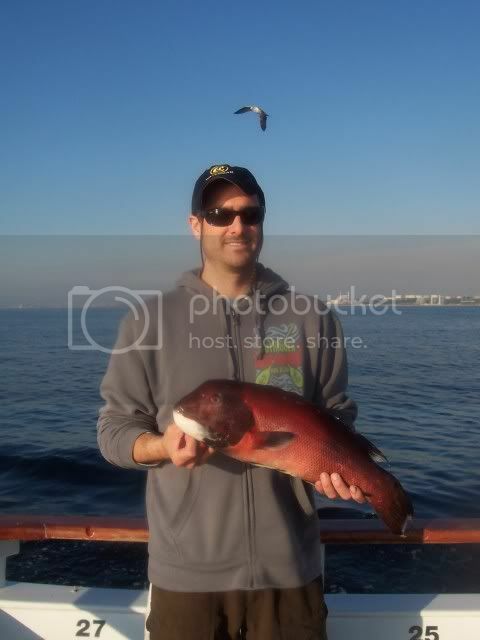 Author with a nice cabazon caught in December 2009. 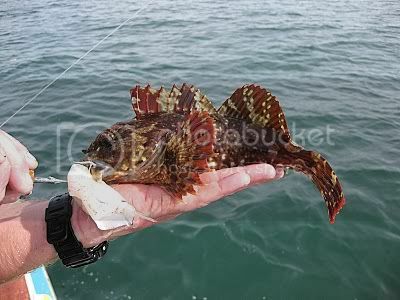 There are some days where you might be able to catch a few great eating sculpin on these reefs in addition to some bass. Little cabby caught in January 2010. 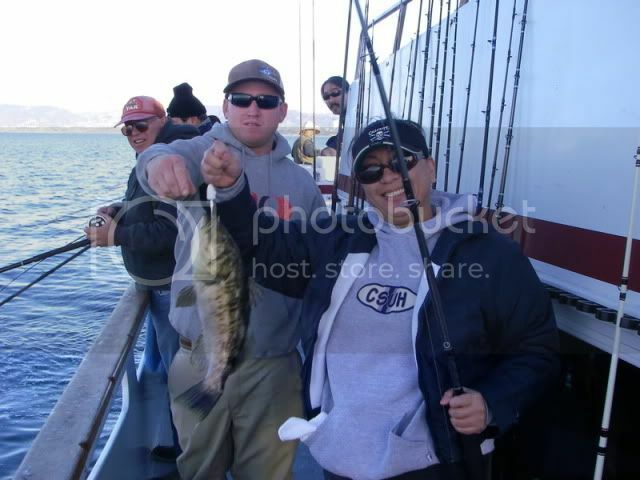 Walter and Morgon with a nice cabazon caught in November 2007. 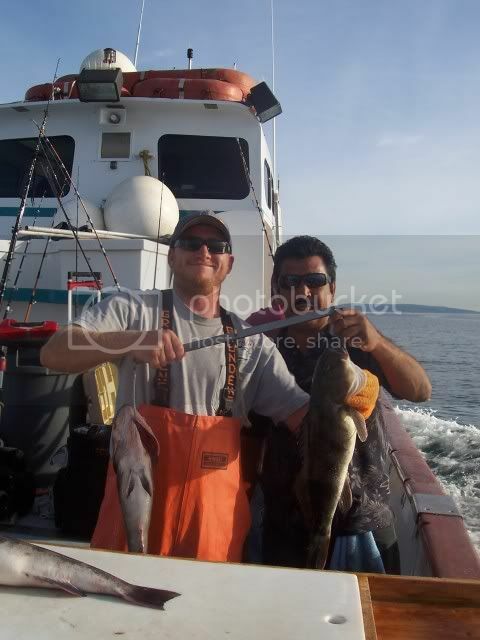 Halibut can be caught right beside the bass while fishing the stones. The author is not liable for chronic frustration as a result from readers fishing the artificial reefs. In all seriousness, this fishing may frustrate you, but I know that you will love it. There will be days where you get your limit no problem, days where fishing might be scratchy, or days where you might lose eight fish in a row…just fish and let learn from your mistakes! No fisherman is perfect at this kind of fishing, so learn what you can, watch others, and you will succeed. Remember to look to see where the rock is located, have fast reflexes, and above all, HAVE FUN!!! 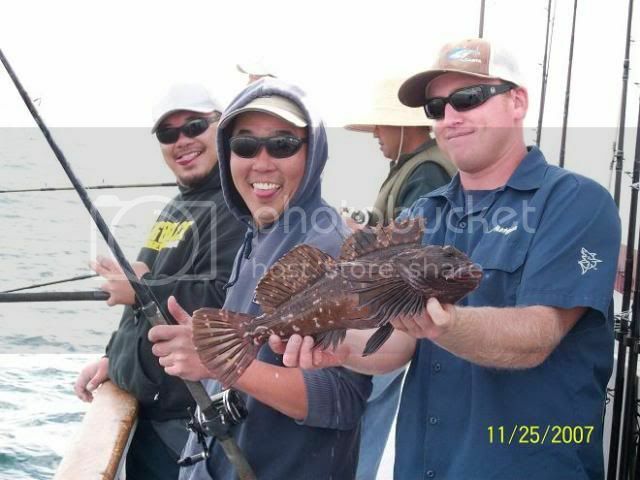 nice report on how to fish the local reefs.thanks alot of helpful info. I wonder if the new DFG warnings will have any affect on RB SP LB landings ? 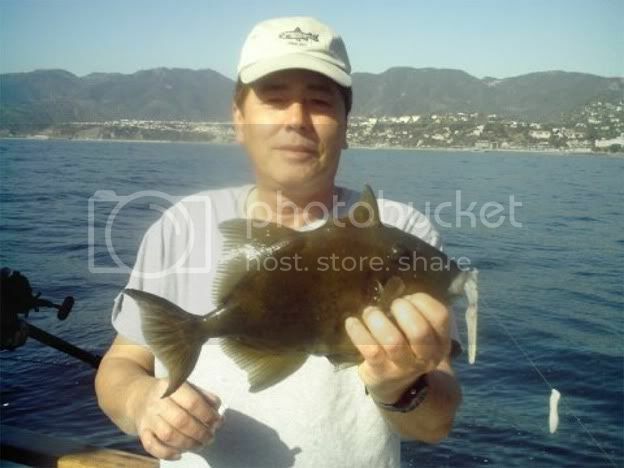 I usually release the Sand Bass., don't care for them too much. they have a outdoor pool with the BIGGEST Sandbass ever. Looks like 30" + and the size of a girth of a volleyball. Free admission. I never remember seeing old line or gear. The Hermosa reef we called it the boxes. Man made concrete with lg pizza size holes. Check out this video of Hermosa Reef. XLNT write up, I'm sure there will be alot of people heading out to the structures, nice. Thanks for sharing the info.